Not many people can say their home incorporates a touch of fashion designer Valentino’s flagship store on Fifth Avenue in New York, but that’s all about to change for buyers of West Melbourne’s newest apartment address, Adderley at West End. Adderley features 74 one, two and three bedroom apartments over 14 levels. 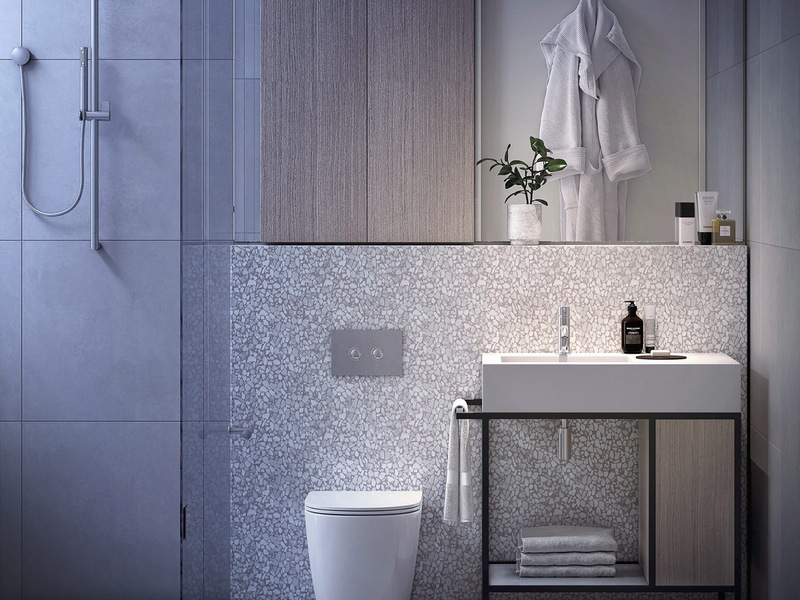 Developed by Trenerry Property Group and with interiors designed by Carr Design Group, Adderley has been crafted using the exact Milano Terrazzo stone used by world-famous architect David Chipperfield in what was his first new concept store for Valentino. Carr Design Group has referenced the terrazzo liberally in the bathrooms and kitchens of Adderley to frame the island benches, splashbacks and vanities. By hiding all appliances behind a stone inset, a sculptural, bold and stylish statement is created throughout each apartment. Inspired by Italian architecture and the stylings of Italian Vogue, and with the discerning tastes of owner-occupiers in mind, this incredible design element is just one of many impressive and unique interior features that are appealing to buyers. The experience begins in the marble-clad lobby that doubles as an art gallery, where a concierge will greet residents as they arrive home. Inside, the kitchens have been designed as a sculptural work of art, where the terrazzo is softened with timber joinery, pendant lighting and metal detailing in a nod to West Melbourne’s industrial past. 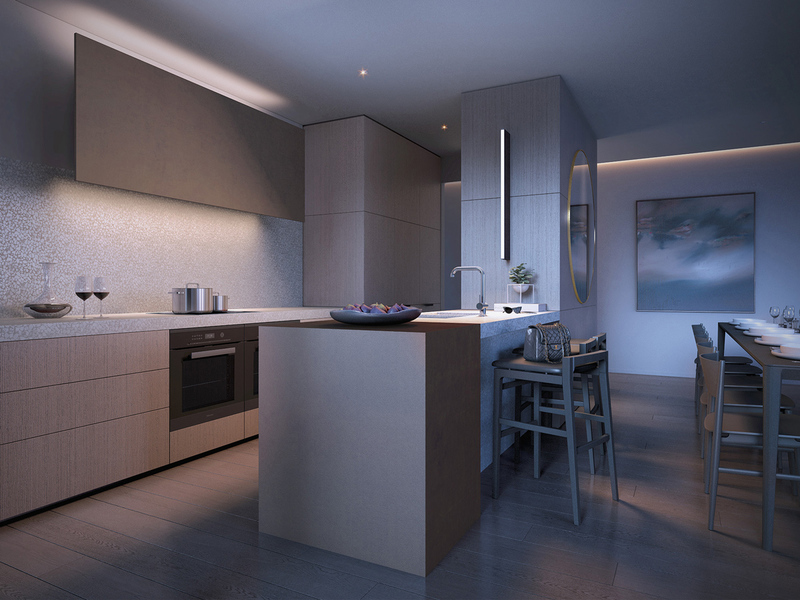 “Adderley brings the high-end, bespoke design we are known for in residential arenas to an apartment setting, creating a truly unique and unexpected home with extra-high ceilings and a glass façade offering incredible views of the city, Docklands and beyond,” commented Trenerry Property director Robert DiCintio. To suit the downsizer and family market in particular, many apartments even boast private living quarters and separate bedroom wings to deliver privacy and zoned living environments. “The local market is craving something interesting, detailed, classic and timeless but also adventurous and edgy. We looked to the Italian masters and were inspired by bold geometric forms when designing Adderley,” commented Di Cintio. Buyers at Adderley will have the opportunity to benefit from the onsite hotel services which will include room service, cleaning and a 24-hour concierge, as well as almost 2,000sqm of gated resident gardens including a 25-metre lap pool, gym, spa and relaxation retreats. Other amenities include a wine cellar, a medical centre, restaurants, and bars. Residences at Adderley range in price from $720,000 to $6.5million. For more information or to register your interest, visit our Adderley development listing. Discover more apartment developments in West Melbourne here.